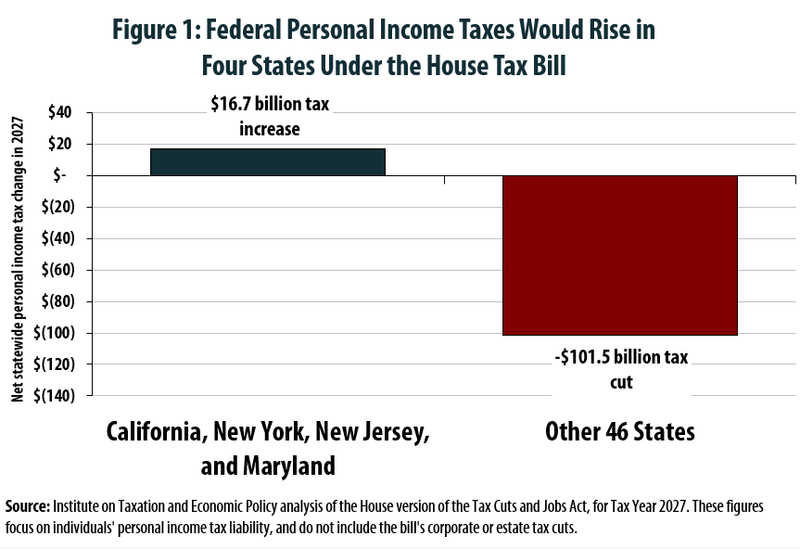 An ITEP analysis reveals that four states would see their residents pay more in aggregate federal personal income taxes under the House’s Tax Cuts and Jobs Act. 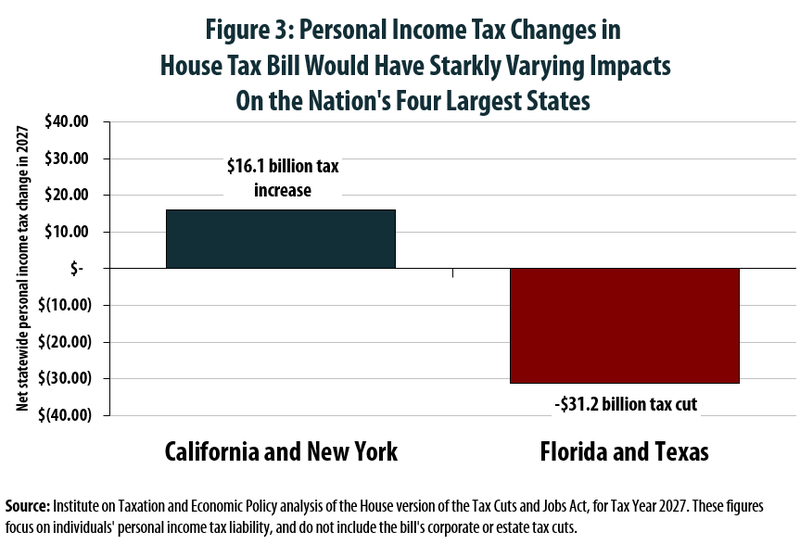 While some individual taxpayers in every state would face a tax increase, only California, New York, Maryland, and New Jersey would see such large increases that their residents’ overall personal income tax payments rise when compared to current law. Californians would face the largest net tax increase, at $12.1 billion in 2027 alone. They are followed by New Yorkers ($4.0 billion in higher income taxes), Marylanders ($430 million), and New Jerseyans ($137 million). Overall, the residents of these four states combined would pay $16.7 billion more in federal personal income taxes by 2027. These increases are due in large part to House leadership’s decision to dramatically curtail the deduction for state and local tax payments. In effect, the tax increases falling on residents of these four states would be used to partly fund the tax cuts flowing to other parts of the country. 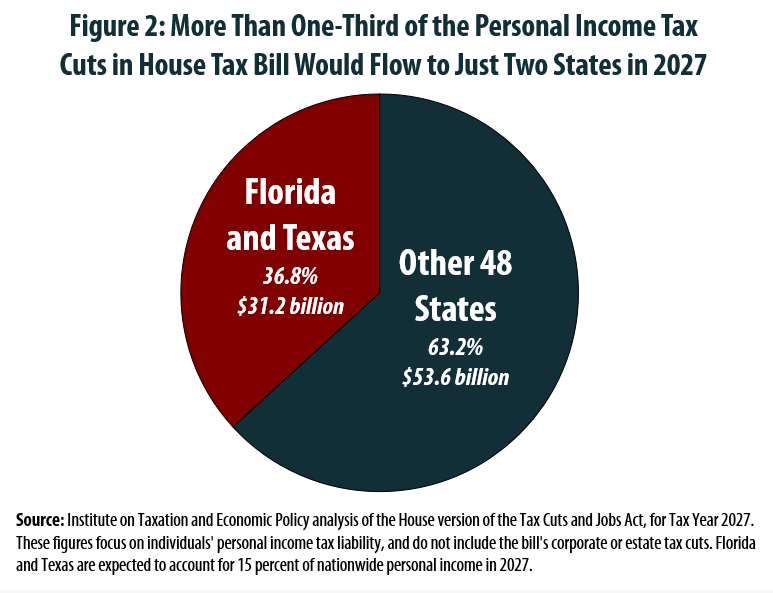 ITEP estimates that the House bill would reduce federal personal income tax collections by a total of $84.8 billion in 2027, and that more than one-third (37 percent) of those cuts would flow to just two states—Florida and Texas. For context, these two states are expected to account for just 15 percent of nationwide personal income. The highly uneven impact of the House’s Tax Cuts and Jobs Act is perhaps most apparent when looking at how the nation’s largest states would fare. Figure 3 shows that California and New York residents, as a group, could expect to pay $16.1 billion more in federal personal income taxes in 2027. Florida and Texas residents, by contrast, could expect their combined federal personal income tax payments to plummet by $31.2 billion in that same year.